Provide comfort for the family of Michelle Crouch with a meaningful gesture of sympathy. On March 15th 2019 at 3;24 a.m., beloved daughter, wife, mother and grandmother, Michelle Yvonne Crouch age 52, who was a home maker and care giver, succumbed to complications of pneumonia and was received into the loving arms of her Creator. She was born Tuesday, January 17, 1967 in Decatur, Illinois, she was the daughter of Terry Bennett and Elane Ax Bennett. She is preceded in death by her father-in-law Leonard Crouch, her brother-in-law Ricky Crouch as well as her paternal grandparents Norris Jr. Bennett and Minnie Alice Downing; maternal grandparents Clarence and Hazel Ax. Michelle is survived by her loving husband of more that 10 years Gerald Crouch; her mother-in-law June Crouch; her parents Terry and Elaine Bennett; brother Gregory Bennett; her sons Justin and Zachariah Nunley; her daughter and son-in-law Ashley and Joshua Basham; her step-children Matthew Crouch, Jenny Crouch, and Robin Crouch; and her 13 grandchildren and step-grandchildren Izabella Nunley, Zephyr Nunley, Alistar Nunley,Sebastian Basham, Stella Basham, Scarlett Basham, Vivienne Nunley, Silas Nunley, Zerak Ward, Eli and Riley Mabe, Hayden Holder, and Haylee Emigh all of the McMinnville area. A Memorial service remembering her beautiful life will be at 2:00 PM on Friday at The People of the Living God Chapel located at the corner of Beersheba Springs Hwy and Walker-Wanamaker Rd. McMinnville, Tennessee 37110, with Thomas Scullin officiating. 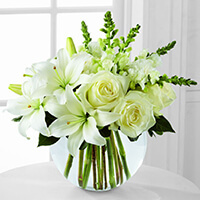 To send flowers in memory of Michelle Yvonne Crouch (Bennett), please visit our Heartfelt Sympathies Store. Beersheba Springs Hwy and Walker-Wanamaker Rd. From the family of Ronald and Stephanie Scullin and Willeford Family - have sent flowers to the family of Michelle Yvonne Crouch (Bennett). Our heart felt condolences. Michelle and the Bennett family are in our thoughts and prayers. From the family of Ronald and Stephanie Scullin purchased the The FTD Tender Touch Standing Spray for the family of Michelle Crouch. Wishing you peace and comfort. Our prayers and thoughts are with you. 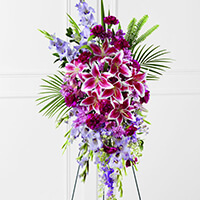 Willeford Family - purchased the The FTD Special Blessings Bouquet for the family of Michelle Crouch. I am so sorry for the loss of your beloved Michelle. This is never easy to face, in fact death can be viewed as an enemy. That's how our Creator Jehovah views it as according to 1 Cor. 15:26; which says, "And the last enemy, death, is to be brought to nothing." May you find comfort in knowing this and that he has a longing to conquer that enemy, to undo death by means of the resurrection. Please visit jw.org for more comforting information.